Dorjun has an able support crew of volunteers that help to look after her. They figure they have more than 250 years of maritime experience among them, so there should be plenty of sea stories to tell! They have been contemplating a commemorative voyage to Alaska, 80 years after Amos Burg and Roy Peppers voyage of 1936. 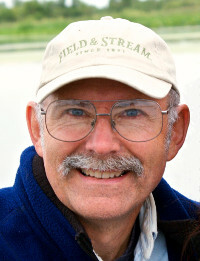 Bruce Garman, Port Orchard Washington, is Expedition Chief for the Dorjun Commemorative Alaska Voyage, and he is the principal force behind Dorjun's restorations and preservation. Garman first saw Dorjun while courting his wife Virginia Yunker (Virginia's uncle was married to Amos Burg's sister, Vera Yunker). At that time, Dorjun was stored in Oak Grove, Oregon at the home of Virginia's father, Andrew Yunker. Dorjun had been hauled there by Burg and Andrew in 1950 when they rescued her wrecked hull following a long grounding in the Columbia River mudflats where she lay after breaking loose from her moorings during the epic Vanport flood on May 30, 1948. "Burg's tales of adventure in Dorjun intrigued me," Garman shared. "I was particularly interested in the Cape Horn explorations that he did with Roy Pepper in 1933 (outlined in Burg's National Geographic article, Inside Cape Horn)." Garman's interest in the expedition resulted in a trip to Ushuia, Argentina in the 1980's, with his friend Jerry Christensen to retrace the Cape Horn expedition (Jerry is another crew member for the 2015 Dorjun voyage to Alaska). After the Cape Horn expedition, Burg and Pepper had sailed Dorjun up the Inside Passage to Alaska in 1936. "This 2015 Inside Passage trip is a wonderful opportunity to retrace Amos and Roy's Dorjun voyage to Alaska and to perpetuate sailing adventures in this grand little vessel." 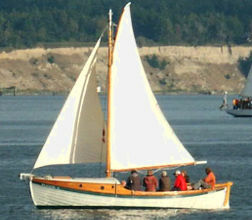 In 1988 Garman moved Dorjun from the Yunker's yard and brought her to his home in Port Orchard, Washington to begin her restoration. "It took 38 years and one dollar to get my father-in-law to release Dorjun to me to complete her restoration," Garman said with a smile. After dedicating generous investments of time and resources, and employing the talents of Point Hudson Shipyard's Ed Louchard and Steve Chapin, Dorjun was beautifully resurrected. During the 1992 Wooden Boat Foundation's annual Wooden Boat Festival, Amos Burg's widow Carolyn Burg rechristened Dorjun, which was a festival highlight. Then, in 1996 Garman donated Dorjun to the Wooden Boat Foundation and Maritime Center along with a maintenance endowment to ensure her future preservation. The Wooden Boat Foundation and Maritime Center continue to use and maintain Dorjun. She is the sweetheart of the fleet and one of the favorite vessels employed under their youth and adult sailing and education programs. Garman is retired from a career in the U.S. Navy (aircraft carrier flight deck operations), yacht brokerage owner, elevator safety inspector, and courtroom bailiff. He is a former cruising sailboat racer, and sailing instructor with 40-plus years of sailing experience. He grew up spending summers on remote Waldron Island where he continues to enjoy his summer home with his wife and family, including eight grandsons and five great-grandchildren. Waldron Island will be an early stop in Dorjun's 2015 commemorative voyage to Alaska. 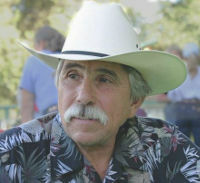 Vince Welch: age 65, Portland, Oregon. Vince has been around the water throughout his life both professionally and relationally as a river guide, commercial fisherman, abalone diver, surfer, and sailor. He has taught grammar school and English-as-a Second-Language in addition to being an author and writer. Magazine credits include the Boatman's Quarterly Review, Oregon Coast, Wend, Rivers, Utne, and Mountain Gazette. Book titles include co-author of The Doing of the Thing - The Brief, Brilliant Whitewater Career of Buzz Holmstrom and solo author of The Last Voyageur - Amos Burg and the Rivers of the West. 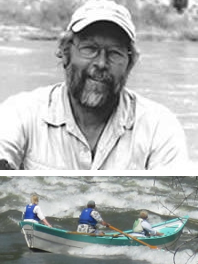 He continues to run rivers in his wooden dory Music Temple with his wife Helen and other ex-river guides. His two children, Jake and Gwen, have flown the nest. Wanderings have carried him to Mexico, Hawaii, New Zealand, the South Pacific, and Europe. 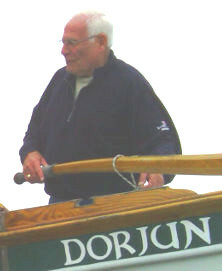 Conducting research for his book on Amos Burg provided his connection to the Dorjun and crewing for the 2015 commemorative sailing up the Alexander Archipelago. Nancy Long is crew and helping with communications for the Dorjun Commemorative Voyage to Alaska. She had the good fortune to meet Amos Burg in the 1980s; Burg being the first person she interviewed in her position at Juneau's local public television station. She produced a TV short story and later a feature length documentary, The Journey of Amos Burg, for PBS. It was through the documentary research that she really got to know Burg, learned of the Dorjun, and subsequently became friends with fellow crew members Fritz Funk and later Vince Welch and Bruce Garman. "Amos Burg continues to play an important role in my life as a mentor and creating connections and serendipitous encounters. This voyage is proof of his indomitable spirit and confounding and wonderful affect on me. I'm looking forward to this Burg commemorative voyage from my new home near Port Townsend to my old home in Juneau." Nancy grew up boating, fishing, crabbing, clamming, and playing on beaches in the Pacific Northwest. As a teen, she crewed for a season racing Thunderbird sailboats, has worked on fishing boats, and continues enjoying sailing and boating. She has also rowed and rafted several Western rivers in addition to rivers in India and Peru. She has been a videographer, editor, director, writer and producer for public television, and worked for independent TV production companies. 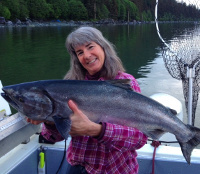 Over the last 15 years, Nancy worked as the Chief Information Officer for the Alaska Department of Fish and Game (a position that was created and first held by Amos Burg) and coordinated the Becoming an Outdoors-Woman program in Southeast Alaska. Nancy shares her time between Whidbey Island, Washington and Juneau, Alaska. She is currently semi-retired and enjoying life with her husband Butch and seeing her son Zac develop into a fine young man. In addition to boating and beach combing, she savors time hiking, biking, pod-camping, playing sports, and creating in the pottery studio. Urban brings 45 years of sailing experience to the voyage, including an Atlantic crossing to Italy in 2007, crewing on sail boats in Central America and in and from Mexican waters, 4 months as crew on a 3 masted schooner of 1903 vintage, 4 years restoring a live-aboard wooden sailboat in Norway, and years ago spent a fair amount of racing sailboats. He is an avid skier & fisherman and a longtime friend of Vince Welch, with whom he has shared many adventures. He is semi-retired, has been owner of a construction company & other businesses, as well as a Wilderness Horse Pack Station and ex-rancher and most importantly for this voyage, a restaurant owner. Urban has been married to Cynthia for 45 years, with 2 children (Nathan & Heather), and 5 grandchildren. Reading Vince Welch's book The Last Voyageur piqued his interest in Amos Burg. "When Vince mentioned this Alaska Inside Passage voyage in Dorjun, I could not pass up another adventure with Vince, so I signed on!" Ron Price, Clark Air Force Base, Philippines.